Invisalign is an almost invisible alternative to a dental brace. For this process, transparent, removable splints (“aligners”) are worn. These removable aligners are almost invisible on the teeth. Invisalign is not only almost invisible, but it is also impairs speech less than other dental braces. Furthermore, the aligners are removable, thereby interfering less with everyday life. Therefore, the aligners can be removed for eating or cleaning the teeth. What is treatment course with Invisalign? To begin with there is a comprehensive consultation with our orthodontist, during which the suitable treatment steps are defined. 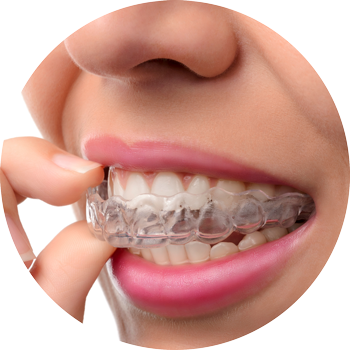 New aligners are produced by the orthodontist about every two weeks during the treatment, depending on the individual progress of the correction. The time required for an Invisalign treatment varies from case-to-case, as does the number of aligners needed, depending on the extent of the desired correction and the individual reaction of your teeth to the therapy procedure. Generally, an Invisalign treatment takes about 6 to 18 months. An Invisalign treatment can be maintained without any problem.